Mokka mit Schlag » Hybrid Mallard/Northern Shoveler? At first it had its head tucked in, and I thought it was a Northern Shoveler, but when it swam away the head and bill were clearly Mallard like. Probably can’t be sure without a blood sample, but it looks to me like a Mallard x Northern Shoveler. I’m not sure if this is a known (or even possible) combination. Or it could be a hybrid with some other species. 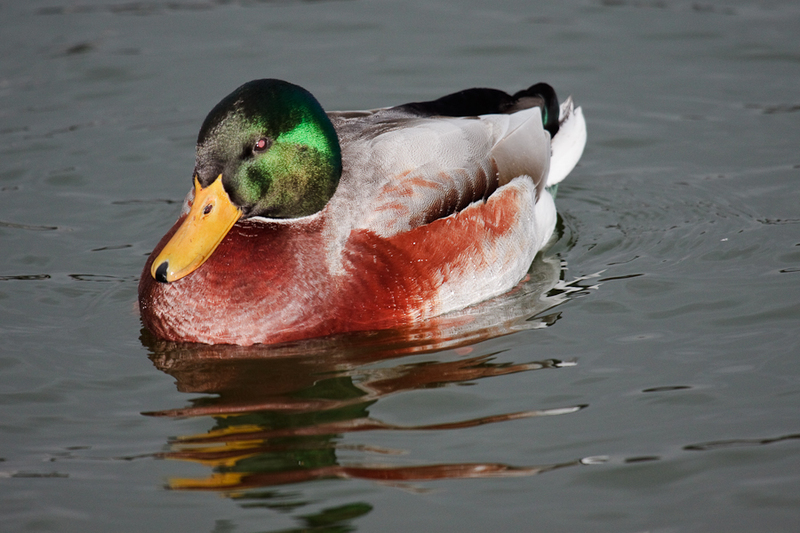 Mallards regularly hybridize with almost anything vaguely duck-like. It could also be an escapee exotic from some distant land like the Australasian Shoveler. Just yesterday I miscalled a Cape Shelduck as an immature Black-bellied Whistling Duck. Or it could be a full-blooded drake Mallard with aberrant plumage. This entry was posted on Sunday, January 24th, 2010 at 2:00 PM and is filed under Birding. You can follow any responses to this entry through the Atom feed. You can skip to the end and make a comment. Pinging is currently not allowed. Is clearly a northern shovler and mom is a mallard.